Excellent for café’s and restaurants, supplied boxed with 2 hooks for window hanging, 2 metres of chain, cable with three pin plug and cable ties. 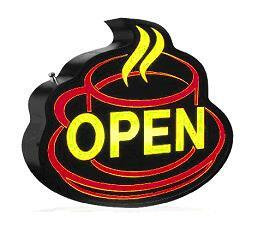 With the awesome steam effect from this OPEN SIGN customers are under no doubt that hot liquid refreshments are within. Excellent for café’s and restaurants, supplied boxed with 2 hooks for window hanging, 2 metres of chain, cable with three pin plug and cable ties.